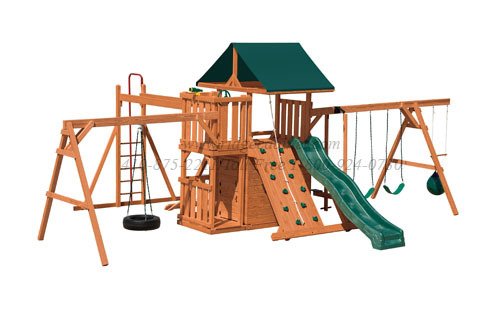 Children's Amazing Wood Climbing Tower with Swings, Buoy Ball, Glider, Scoop Slide, Mountain Climb, Cargo Net, Tire Swing, Hand-Over-Hand Climber Bars, Lookout, Hideout, and much more . . . The ground area recommended for this set is 30ft long and 23ft deep.